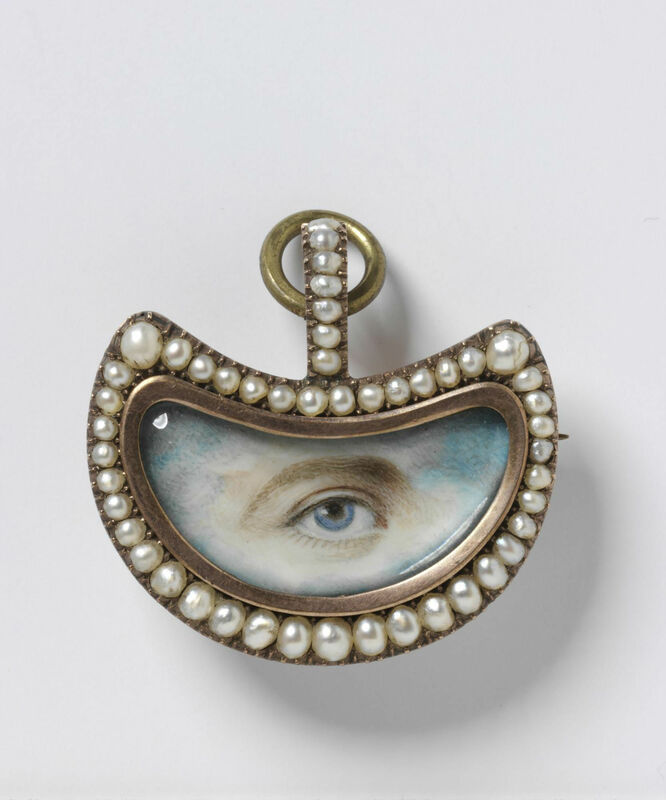 A miniature eye painting from the early 19th century. © Victoria and Albert Museum. SOMETHING WAS UP. A fine, soft mold had formed, colourless and clear. It thrived on surfaces beyond my reach. Another notion: someone had lightly greased the world with viscous, transparent stuff. Every edge was just a little bit thick with it. When I approached it, it retreated and settled on neighbouring objects, again ones I could not touch. Too mobile, then, for a fungal growth, and too dry for goo, since it left no residue. Unlike a fog, it travelled with me. Often, it left the distance and came up close, depositing its film on my cornea, a mucus that nothing washed away. By fall, every moment of seeing had this consistency. Probably it was not new. I had just missed the beginning. Rather than the onset itself, I recall an eye exam in November. The optometrist’s assistant divided my sight in two, testing one eye, then the other. My chin rested on a cradle behind a mask of rotating lenses. The row of letters on the opposite wall grew more or less sharp as she adjusted the settings. I reported the results. Now better, now worse. Through separation, she discovered my asymmetry before I did: The muted atmosphere in the distance lifted when my right eye was covered; it condensed into a cloud when it was the only eye exposed. Afterward, I played with switching eyes, comparing sides, as my pupils slowly dilated. It was the second stage of the exam. A pleated lampshade held dim light down low on a table in the waiting room. Beside me, a father read his son the story of an eyepatch. The eye it covered was normal; the patch didn’t serve it. It was worn to make the uncovered eye work harder. Are hands industrious because we’ve left them so often unclothed? Is exposure a means of their training? I covered one eye to keep my brain from combining it with the other. Numbness set in from the drops, proving that eyes are something you otherwise feel. Non-sensation felt like something too: eyelids impressed me with their subtle mass. My eyes wore them as a second skin, of bulky material, symmetrical hoods to hide their bare heads. Or to partly reveal them. A dress will sometimes fall from the shoulders until it catches in a place that is wider than its opening. Like unclosing your eyes to see who’s saying your name. I was escorted to another room. The optometrist guided a light through my widened apertures. Frames seemed designed to measure someone else’s dimensions. They implied a void whose contours described all of the heads that could fill them. Most of these heads were larger than mine. Worn by me, many frames became cartoonish, however serious or playful their shape. It was powerful, my ability to caricature their boldness and self-assurance, even their modesty. Displayed on their own in sparkling glass cases, all eyes with their slender arms folded expectantly, they had the attractive remoteness of sheer ideas: Practical, intellectual, unassuming, offbeat, voluptuous. The question was how my proportions intercepted the transmission of these signals. Wrong size and the attributes of these objects clearly had nothing to do with me. Wearing them looked like an overt attempt to give myself their personality. Apart from fit, there was the business of having to adjust to a new face. I thought I might avoid this by selecting clear frames, as though it would lessen the impact. This choice was offset by their roundness and thickness, which made them neither inconspicuous nor immaterial. I saw them plainly. In fact, I found them beautiful. If anything, they blurred my features as opaque frames could not have done, with their distinguishing outline. Perhaps I liked seeing the frames without seeing myself enhanced by them. It kept me intact. When my glasses were ready, I left the store with them on my face and continued down the street. They did their job; the distance lost its former texture. But the abrupt distinctness emptied my surroundings of their depth. It was all equally close: the strangers who passed me, the sidewalk, the creases on the leaves. My steps narrowed to avoid collision. I tried to project the nonchalance of someone who doesn’t remember what she has on. It was a lie, my acting like I wore glasses, like I did this all the time. The evidence weighed on my nose, bore down on the tops of my ears. Really wearing them meant not feeling their touch, letting them vanish, whereas I couldn’t shake the impression that having them on my head was the main event. I saw clearly, yes, but it was them I looked at. The frames stayed within my field of vision, exceedingly near but always just ahead of me, so that I was constantly pursuing them. Like the frames, the lenses were of clear plastic, a few millimetres thick. They accumulated oil and miniscule debris. If I entered a warm cafe in winter, I saw them instantly shrouded in steam. I had the sense then that what covered my eyes concealed all of me, as when, during hide and seek, a child obscures only her face. The feeling was not diminished by wiping away the dampness. I lived behind a transparent barrier. The left lens was a fake. It obstructed my good eye for the sake of the one that needed correction. Contacts had an advantage over this situation, which was that I could wear just one. At the fitting, the doctor measured my curvature and brought out the closest match. He taught me how to put it on it. Hands washed and dried. Lens on fingertip. Check for rips and eyelashes. Tug lids open. Look into mirror during approach. Press harder. To remove, pinch between thumb and index finger. It won’t scratch you. Rub to dislodge buildup. Bathe in solution overnight. The lens was membranous and slick. I had thought them all rigid, like the ones in my glasses. It adhered weightlessly to my cornea, extending past it into the white. Light passed through it into further strata of tissue, refracting as it should. Up close, there must have been a gap between its concavity and my outermost layer. Nearsighted though I was, I could not see the numbers I knew were written on its surface. Nor could I feel the delicate sheet of plastic itself, which water permeated as it would an amphibious skin. My eye was accustomed to an aqueous environment. The moisture of the lens felt just like nothing, like an eye untouched. What garment, in fact, touched me less? How would I remember to take it off? Susan Morrow is a doctoral candidate in German at Yale.